The first advantage to recording info on all your patterns in the same place, is that it allows you to get an overview of your collection. 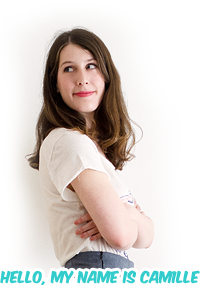 I don’t know about you but between my shoe-boxes filled with paper patterns, my shelves of books and indie patterns, my boxes of sewing magazines and my external hard drive full of pdf patterns, it happened more than once that I purchased a new pattern only to realize I already had an almost identical one. • Dresses: Shirtdresses / Fit-and-flare / A-line / Vintage reproductions / Misc. • Skirts: Pencil skirts / Pleated skirts / Flared and circle skirts / Maxi skirts / Misc. In these lists I place one card per pattern, to which I attach its technical drawing, which allows me to understand more easily the lines of the garment than using fashion drawings or pictures, so I can compare between brands. In the case where a single patterns contains several garments (for instance, Vogue V8875 has both a dress and a coat) then I put cards in each corresponding board, with only the relevant technical drawing. 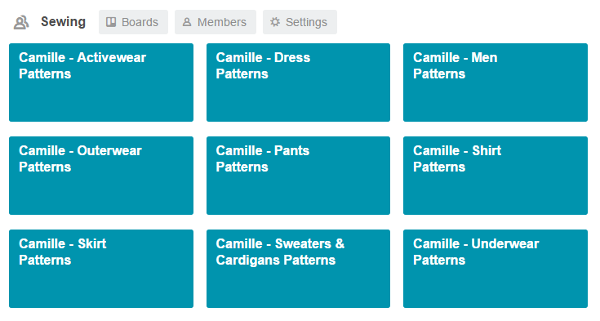 The second advantage to having all of one’s patterns on Trello is that this information is then available anywhere. No more scribbling yardage and notions on scraps of paper before a trip to the fabric store, or struggling to find it on a phone screen while in line at Jo-Ann’s! In addition to the pattern references, I write in each card’s description the recommended fabric type, yardage and notions. 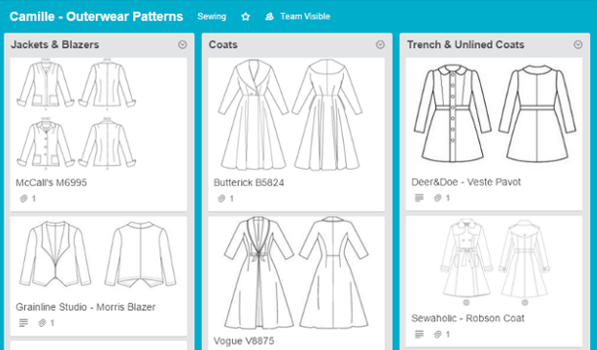 Another useful habit is to add some keywords: deer&doe, dress, buttons, buttonholes, bow, collar, princess seams… The goal here is to be able to use Trello’s search functionality to find patterns with these keywords. So by searching for “deer&doe” for instance, I can find all of my patterns from the brand, no matter which board they belong to. 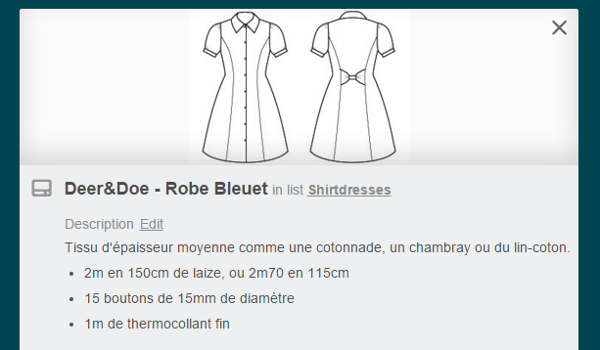 Similarly if I search for “Burda 01/2011”, I’ll find all the patterns of this issue that I indexed. 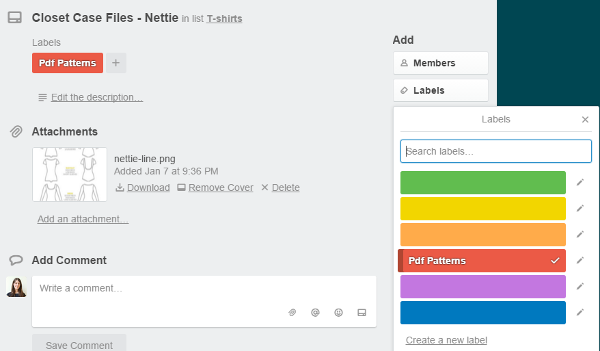 The last point I wanted to talk about is the possibility of using Trello directly to store pdf patterns! 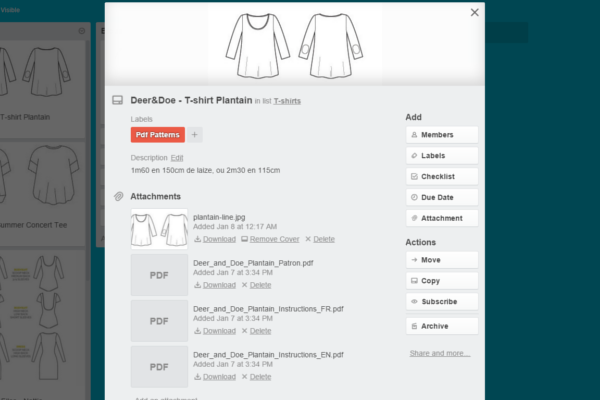 In addition to line drawings, you can also attach pdf files to the cards: Trello accepts files up to 10Mb, which is usually enough for pattern and instruction files. If your file happens to be over the limit, you might still be able to compress it (using online tools such as smallpdf) so it goes back under 10 megs. When I add a pdf pattern, I also add to the card a label that identifies it as such (these are the red marks on my screenshots). When you create a board, the labels are just different colors, without added meaning. If you want to name them, you need to go to the board’s options: More > Labels, and then click on the color to add a textual label. Here I named it “Pdf Patterns”. Note that labels are board-specific, so you’ll need to do the same manipulation on each of your boards. Hello! 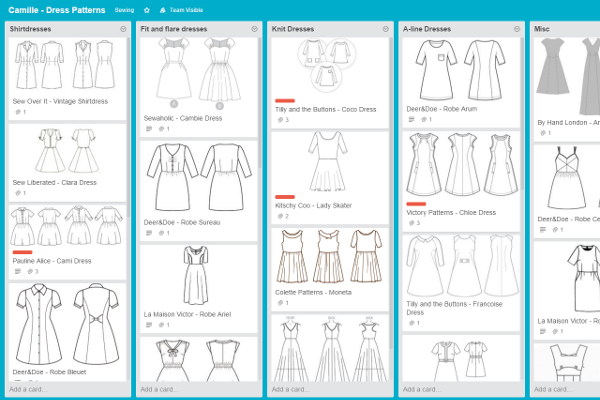 This is a great post, and has encouraged me to start using trello – I have a couple of questions, if you have time – it looks like you have an entire sewing section with boards? Is that right, and if so, how did you do it? Also, how did you get the line drawings for the pictures? I think this is something that is probably obvious, but I’m having a hard time figuring it out. Again, thanks for the tut, I really appreciate the work that goes into these things! Hey, that’s really nice! I would like to adapt it but I’m afraid, that it doesn’t work for all patterns I have. Can you tell me how many patterns you have? C’est exactement le type d’organisation que je cherchais ! J’étais prête à développer ma propre webapp tellement je désespérais de trouver un moyen facile/pratique d’organiser/trier/filtrer/chercher ma patronthèque ! Merci, merci et encore un grand merci pour la route ! Oh my! 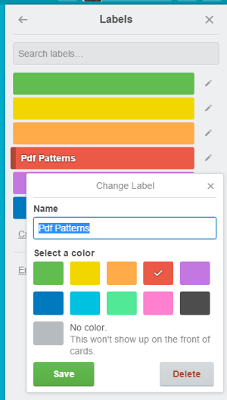 I just last week added all of my patterns to Pinterest with the pdfs in Dropbox and am already despairing that there was no sort of organisation. This is so useful, Mallory was talking about it on the Self Sewn Wardrobe, I downloaded it but was then a bit stuck as to how to use it. This is brilliant, thank you. I am so happy this was useful! Thank you SO, SO much for this. It completely changes my organisation. I’ve dived in, I had trellis already but didn’t really understand all its features yet and I kept putting off working with it. I’m now using all your tips, not only in sewing but ALL of my boards. I came to thank you and pay it forward: because I have figured out a way to transfer labels between boards. Create a card with all labels assigned, and move it to a new board. This could very well just be an empty card, solely for moving around. The empty labels will apoear,as well of course, but i didn’t mind that. Again, thank you so much, not only for these three posts, but also for your very inspirational blog.